Holy Basil has been used for many years as a medicinal herb which brings the body systems into balance and increase resilience (Roizman). Research has shown that holy basil can help to treat certain medical conditions; however, more research still needs to be conducted. Research conducted by the “Journal of Medicinal Foods” found that holy basil has detoxifying effects on the body. 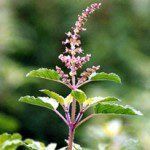 The detoxifying effects of holy basil protect the liver from damage and prevented the oxidation of lipids and proteins from free radicals (Roizman). Holy basil also enhanced the detoxifying effects of liver enzymes. A study published in 2007 in the “Journal of Natural Products” found three new active compounds in holy basil that have the ability to reduce stress in rats. These three compounds were able to reduce stress by reducing blood sugar and cortical levels as well as conserving energy production and decreasing adrenal size (Roizman). Scientists are hoping to find similar results in humans within the next few years. Holy basil is also used to treat coughs, sore throats and the common cold by boosting the body’s ability to resist viral and bacterial infections (Holy Basil). Side effects of holy basil include blood thinning, hypoglycemia and decreased fertility (Landis-Steward). “Holy Basil.” herbs List, 14/06/2011. Web. 2 Jul 2012. Landis-Steward, Susan. Side Effects for Holy Basil. Livestrong, 29/04/2011. Web. 2 Jul 2012. Roizman, Tracy. Holy Basil Health Benefits. Livestrong, 28/04/2011. Web. 2 Jul 2012.